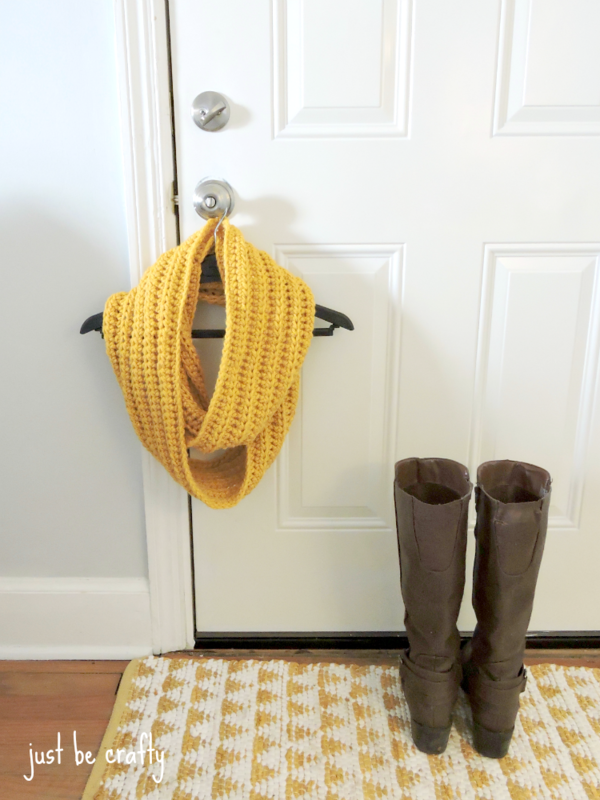 This chunky crochet cowl pattern is one of my all-time favorite beginner projects! Not only is the pattern super simple to follow, but can be completed in about an hour [or less!] thanks to the chunky yarn! Hello there! 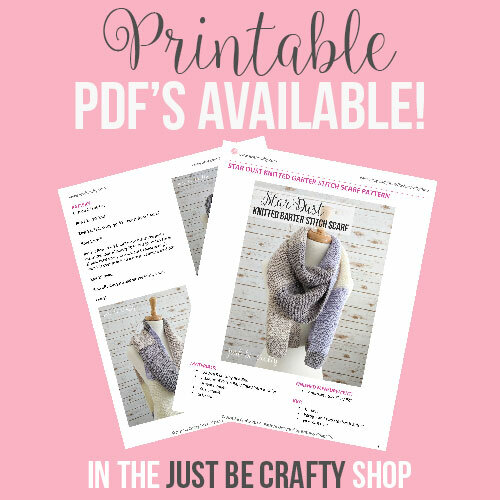 Today I’ll be sharing with you a super simple project to help get through the winter – the Chunky Crochet Cowl Pattern! Whip a few up in any of your favorite bright colors to help cheer up an otherwise cold, rainy or snowy day :). It would also work as a great last minute gift because it can be made an about an hour or two. I love quick projects, don’t you!? The piece is worked back and forth in rows and whip stitched together to turn into an infinity scarf. The scarf is very long and is meant to be wrapped two or three times around the neck. For the pattern, I used Bernat Collegiate Chunky Yarn that I had found at JoAnn’s quite a while ago. I had made a couple of small projects with this skein already and ended up using the rest of it up for this cowl. I don’t believe JoAnn’s always keep this yarn in stock, but I think they typically carry it at the beginning of the school year. If you are unable to find this yarn, any bulky acrylic yarn will do. If I had to guess the yardage used in this project, I am thinking it probably took about 350 yards. Leaving a long tail, cut yarn and secure. Lay the piece flat, and fold in half so that the two far sides are touching. Use your yarn needle to whip stitch the two sides together. Cut yarn and weave in your ends. Put scarf on, and wrap 2 or 3 times, and enjoy! Does the chain two count at a stitch? Hi Allie! No, the ch 2 does not count as a stitch. I like how you reply to comments and questions. Can you adjust the length to any length? Yes! Just add additional/take away desired amount of chains on your foundation chain. What do you mean by in the back loops only? Could you please tell me if 162 chains are for length or width of scarf? thank you very much! The 162 chains is the length of the scarf. Hi I did 162 chain and my scarf is much longer? would you know why. Hi Kayleen! There are a lot of variables that may cause your finished piece to be a different size such as yarn used, hook size, and gauge. This pattern is super forgiving – you can make the chain as short or long as you’d like. Hope this helps! 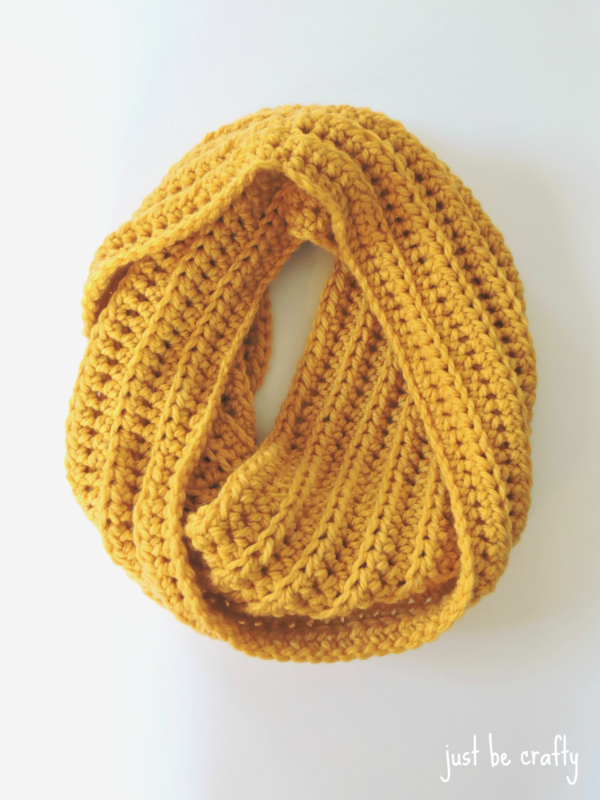 do you have a pattern or tutorial for a mobius cowl. Hi Lorraine! At this time, I do not. Thanks for the easy scarf tutorial! Hi Michelle! Thank you so much for stopping by and saying hello! And hahaha right??!! What other yarns would work? Hi Hadley! Any acrylic yarn with “super bulky” listed on the label will work for this project. Some examples include: Bernat Softee Chunky yarn, or Lion Brand Wool-ease Thick and Quick (this one is a wool acrylic blend). 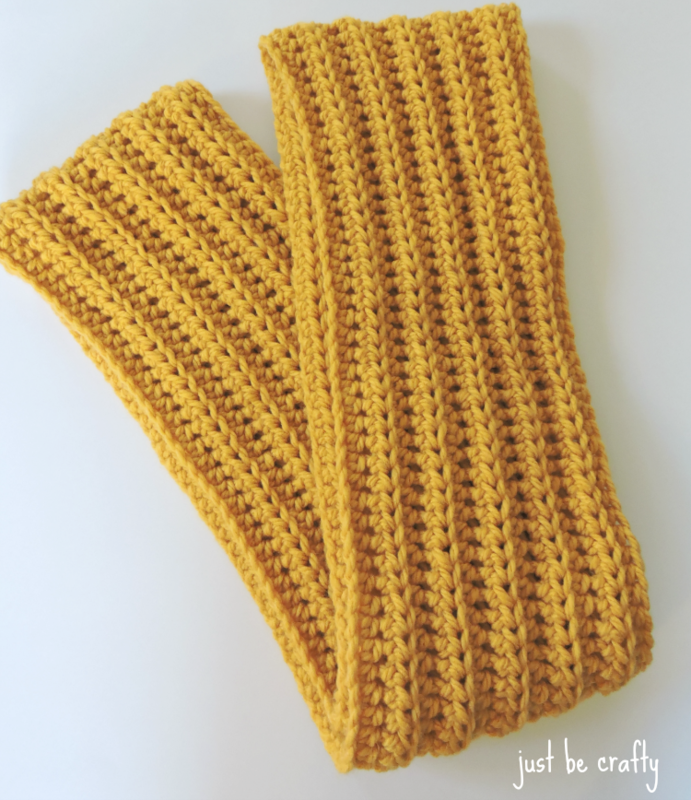 What is a half double crochet? is it just one crochet? Hi Paula! It’s just a like a single crochet but only you yarn over once (like a double crochet) and then when you insert your hook into the stitch to make your stitch, you’ll pull through all loops on your hook. I demonstrate half double crochets in this video if you need a visual. Hi Susie! Yay! I’m glad you like the pattern! I’d love to see your finished cowls, feel free to instagram them with hashtag #justbecrafty :). Is that a crocheted rug in the picture? Could you slip stitch after the chain so that you are working in a circle to alleviate a seam and having to sew ends together? Yes you could, but you will not get the same chunky ribbed look, which is achieved by turning back and forth at the end of each row and crocheting in the back loop. The seam is really not that noticeable. I had the same question and so I worked up a small sample (20 stitches across and 7 rows up) working in the round. I did my chain 2 and then turned and I have still got the chunky ribbed look, so I think it works, you just need to remember to turn you work after you get to the end of the round. I’m going to keep my sample going and make wrist warmers for my daughter to match the scarf I’m making! Hi, I’m putting together a blog about scarfs and would like to use this link and a picture if that is oké. Yes! Thank you so much for including my post :). How many would you recommend to chain of your doing a toddler size? Hi Sandy! Since the number of chains does not matter, I would go ahead and make a chain to the size you think would be best. The length of the cowl will be pretty much the length of the chain. This is such a great pattern and it comes at a great time (Christmas)! I am currently working on a cowl with this pattern for my best friend and then I’m going to do one for my co-worker. Thanks so much for sharing this pattern with us! Hi Kate! It sounds beautiful! I’m glad you enjoyed the pattern! What a wonderful tutorial – very clear and precise instructions – thanks for sharing!! Hi Brittany! Is the 38” measured length for the completed project (folded in half) or the total length before closing the loop? Hi Krystal! Yes, 38″ should be the length of the completed project folded in half. The actual length with the ends not closed would be double that. I love all of your crochet patterns and I can’t wait to try this one!!! If using a thinner yarn, how many more rows would you say are needed if any? Hi Grace! You will want to add as many rows as it takes to make the scarf about 7 inches thick (as in the pattern) or until you reach the desired scarf thickness. Hi Kristina! This pattern is very forgiving, so whichever you would prefer would work – its really just personal preference! Came across this pattern and have been so excited to give it a go as my second ever crochet project. A big part of the appeal is the color yarn, but not having any luck finding a great alternative – what I’m seeing is either super bright yellow, or too hot dog mustard kind of yellow. Have you come across another brand and color equivalent? Hi Cathy! A good similar yarn is Bernat Softee Chunky yarn and they have a lot of beautiful colors! I am having trouble finding this yarn. Sort of a beginner. Would this be considered a size 5 yarn or 6, as I am trying to find a different brand. Hi Jillian! Bernat Softee Chunky is a good alternative!